TIJUANA, Mexico — More than four months after fleeing violence and death threats in Guatemala, R.T. finally had a chance last week to speak to the judge who will decide whether he receives asylum in the United States. As he walked into the San Diego courtroom where he had his initial hearing, his immediate concern was not that he eventually would be sent back to Guatemala, where a paramilitary group controls his hometown — but rather that he would be sent back that day to Tijuana, where he has been waiting for his asylum case to play out. R.T., 31, who asked that his full name not be used out of concern for his safety, said through tears during an interview in Tijuana after his hearing that someone in a black van without license plates followed him one morning in the city and tried to kidnap him; he’s known migrants who were taken for ransom money. Local people have repeatedly thrown rocks at him and others outside the migrant shelters, and in December two migrant teens were lured out of a shelter and killed. Tijuana is experiencing record violence, with more than 2,500 people killed there last year and 488 murders so far this year, according to local reports. R.T. told the judge he was afraid to return to Tijuana. He hoped to stay in the U.S. for the remainder of his asylum case, a process that can take months or longer. Asylum-seekers used to wait in the U.S. for their cases to be decided, but in January the Trump administration began returning some migrants to Mexico after their initial asylum claim at the border. Now, hundreds of migrants are in R.T.’s shoes, stuck in Mexico between court dates in the U.S., living in border towns that some say feel just as dangerous as the home they fled. “We are like a blind man who can only feel the sunlight, but cannot see it,” R.T. said in Spanish from Tijuana. Over the past two weeks, asylum-seekers who had been sent back to Mexico began having their first court appearances in the U.S., exposing the difficulties of living in one country while navigating a complex legal process in another. Migrants described a massive sense of confusion and anxiety as they struggled to find an American lawyer and coped with changes in hearing dates and limited access to working phones. Complicating matters further, migrants like R.T. who say they fear for their safety in Mexico must meet a higher burden of proof to remain in the U.S. than they would in other types of asylum cases, said Mariel Villarreal, an immigration lawyer who is representing R.T. The migrants must show that it’s “more likely than not” that they will face persecution or torture in Mexico, a standard that lawyers say means nearly everyone will be sent back. That’s what happened to R.T. He made his case to an asylum officer in an emotional 90-minute interview last Wednesday and was “very clear about why he was terrified to return to Mexico,” said Villarreal, who works with Pangea Legal Services in San Francisco. But the next day, he was returned to Mexico, with a piece of paper that said in English that he “did not establish a clear probability of persecution or torture in Mexico.” He can’t re-enter the U.S. until his next court date, which is more than a month away. Last month, the American Civil Liberties Union and two other groups filed a federal lawsuit against the policy of returning asylum-seekers to Mexico, arguing that it puts migrants’ safety at risk. In a hearing last Friday, a Trump administration attorney argued that the policy was meant to deter “baseless” asylum claims that were “overtaxing” the U.S. immigration system. Nicole Ramos, the refugee program director of Al Otro Lado, a nonprofit serving migrants in Tijuana and one of the plaintiffs in the lawsuit, said the administration’s policy has had far-reaching consequences. Last Friday, Albert, 35, an asylum-seeker from Honduras, woke before dawn at a church in Tijuana, where he’s been staying for nearly five months. He filled a backpack with his belongings and prayed in the dark. Albert, who spoke on the condition that his full name not be used because he had been threatened by criminals he testified against at a trial in Honduras, had barely left the church in the past month, as it was the only place in Tijuana where he really felt safe. But that day he would travel through the city to get to the El Chaparral border crossing, so he could attend his first immigration hearing in San Diego. He had barely eaten or slept in anticipation. The night before the hearing, dozens of other asylum-seekers gathered around him and prayed together for God to help him. Albert arrived at the border crossing early, anxious and unsure of where to wait for immigration authorities. A volunteer with Al Otro Lado explained to Albert and several other migrants what they should expect at the hearing and then led them to the immigration officers who took them by van to downtown San Diego. That afternoon, in a tiny courtroom on the eighth floor of a private office building, Judge Scott Simpson called Albert and four other asylum-seekers one by one. They sat in two rows, some looking down and clasping their hands. When it was Albert’s turn, he stepped forward and put on a pair of headphones to listen to a Spanish interpreter. He answered the judge’s questions — name, preferred language, whether he had a lawyer — in a low voice. Albert had just secured legal representation that morning. His friend Jill Zwiers, who volunteers with migrants in Tijuana and lives in San Diego, had helped him communicate with two American lawyers who would work with him pro bono. They couldn’t get there in time for this court appearance, but they would be there in the future. Simpson then asked Albert if he wanted to say anything else. “I’m afraid to be in Mexico, I’m afraid,” Albert told the judge in Spanish. Albert was worried about the violence in Tijuana and feared that the criminals who pursued him in Honduras could find him in Mexico. The judge told Albert he would have a chance to speak to an asylum officer who would assess his fear of returning to Tijuana. Albert returned to his seat and buried his face in his hands. His entire hearing took 11 minutes. “He seemed more afraid than I've ever seen him,” Zwiers said afterward. Most of the asylum-seekers at the Friday hearing did not have lawyers. Migrants are given a list of attorneys who will work for free or at low cost, but Zwiers said she has seen migrants spend all day on their phones dialing through the list, unable to reach anyone. Vanesa Castro, who is seeking asylum with her 2-year-old daughter, Andrea, after gangs in Honduras killed her brother and threatened to kill her child, was still frantically looking for a lawyer recently, two weeks before her first hearing. 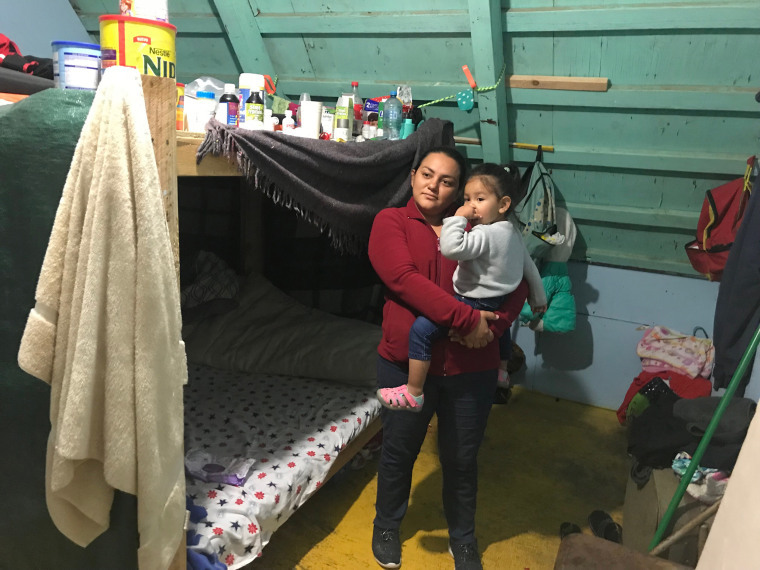 After seeking asylum at the border, she had hoped to stay with an uncle of Andrea’s in North Carolina, but she and her daughter were sent back to Mexico and were staying at a church shelter in Tijuana. She feared the city’s drug cartels and wanted a lawyer to convince a judge that she could stay in the U.S. instead. Villarreal, R.T.’s lawyer, said there are many logistical obstacles facing asylum-seekers in Tijuana. Even once they find lawyers, many move from shelter to shelter with no fixed address. R.T. has trouble charging his phone, and other times he doesn’t have money to buy internet service. Villarreal said the policy of returning asylum-seekers to Mexico without regard for their fears is dangerous. Even as the policy faces a legal challenge, the Trump administration recently expanded it from Tijuana to other border towns, including Juarez. Villarreal fears immigration authorities will “wait until someone actually loses their life” before the policy is re-examined. The Department of Homeland Security did not immediately respond to a request for comment on the policy. Albert had his interview with an asylum officer on Saturday. For 45 minutes, he outlined his fears and answered the officer’s questions by phone about why he felt it was unsafe for him to return to Tijuana. But the officer rejected his claim, and on Monday immigration authorities dropped him back at El Chaparral. He had spent about 72 hours in the U.S., mostly in a detention facility. Speaking from the border crossing, Albert said he would have preferred to remain in detention in the U.S. rather than return to Tijuana. In detention, he was subjected to cold temperatures, held in cramped facilities and unable to leave, but at least he knew he was safe. Now he had to wait another month before returning to the U.S. for his next court date.